Website vs Mobile App: What Should Be Your Focus? Home > The Blog > Web Design > Website vs Mobile App: What Should Be Your Focus? It’s impossible to miss news that mobile devices are taking over traditional computers in both sales and usage. Everywhere you look there’s news about smartphone and mobile apps rapidly on the rise. The rise isn’t just on mobile apps though, which is why the question remains, website vs mobile app? It’s easy to see the rise in mobile device usage correlate with a rise in mobile app usage. There’s a lot more to it than the obvious visible statistics though because it’s more complex than simply saying website vs mobile app. There is a clear answer on which one takes priority, though. I’m going to help you see where people spend their time and what that mean to your businesses digital strategy to grow your business. According to a study by Nielsen three years ago, 89% of mobile time is spent in mobile apps vs only 11% on the mobile web. 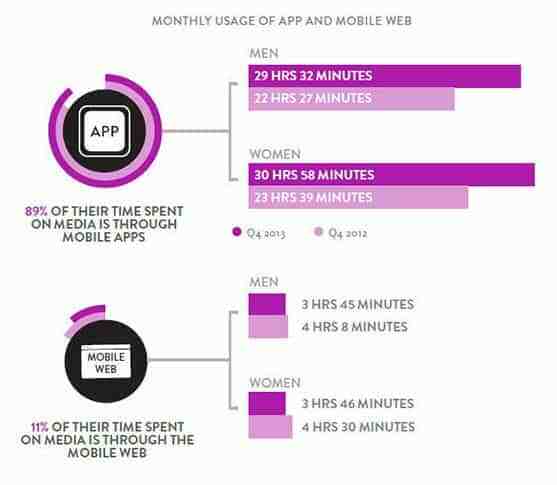 With that large number of time spent in mobile apps, it seems the mobile web is somewhat doomed. There is one caveat to that news, though. Mobile app usage is on the rise but almost all that growth is going to a handful of apps. Only a few apps have any significant usage. Most apps have so little users that the average smartphone user in the United States only uses 26.7 apps (source). From that same article, over 70% of total usage is coming from only 200 total apps with the rest going to an increasing number of apps. That means most apps on the app store are never part of those 26.7 apps in any given month. An app may have a better chance of getting struck by lightning than ever getting downloaded and used. If mobile users aren’t using most apps and aren’t using the mobile browser, how are you supposed to reach them? That’s where a deeper analysis of how people use mobile devices is needed. What ARE People Doing On Their Smartphones? The most used app on smartphones are social media apps and at the top of that list is Facebook. Facebook does a lot of things and gives you access to a lot of people, but it also gives your customers access to the entire mobile web. People may not be using the mobile browser to reach the mobile web but apps like Facebook and Twitter have a browser built into them so you never leave the app. That’s counted as time in the app NOT on the mobile web but they are still spending time on the mobile web. This means the mobile web is accessed and used on smartphones far more than the statistics accurately tell you. That may help guide us in this conversation on whether a website or a mobile app is the best place to spend your money. There are benefits to both a website and a mobile app. Some of the benefits even overlap. Before jumping into where the best place is to put your money, understanding the positives and negatives of each is important. Less costly than a mobile app. Works across all mobile platforms. Can’t take advantage of mobile sensors. May not function as smoothly as an app. Doesn’t need an Internet connection to be available. Can take advantage of all sensors on the mobile device. Can be costly if done well. Platform specific and more difficult to port. Doesn’t work on desktop or laptop computers. Now that we have some of the positives and negatives out of the way, it’s time to look a little closer at where your money should be spent. This is difficult to answer because there are many variables that must go into the decision. If I were to boil down an answer into one sentence I would say: unless you can prove without a doubt an app is the only solution, it isn’t the right solution. Now that I gave the simple answer, it’s time to look at a few specific situations in the website vs mobile app comparison. If it’s been a while since you’ve updated your website and it doesn’t work well on mobile devices (meaning it’s not responsive or has a separate mobile version) then it may be time for a redesign not moving on to a mobile app. Your website is not responsive and isn’t usable on a small mobile screen. Your website is separated into two very different looking versions, desktop and mobile. If you are in either of these two camps, a mobile app should not be on your roadmap until after you have taken care of this problem. Your first priority should be to have a website, always. Even if your business is a mobile app, a website is a necessity. Unless your app is part of those top 200, you’ll want a website so you can be part of the mobile ecosystem. Without a website, there is no website vs mobile app comparison so put a good responsive website on your business roadmap. If you have a good responsive website and are satisfied with how it’s converting visitors, it might be OK to think about a mobile app. I won’t say run out there and get a mobile app though. There are a lot of companies who will make your business a mobile app for cheap, but it often won’t be something you would want to represent your business. Out of all the situations mentioned above, most of them are already an important part of the mobile ecosystem. If your business has a responsive website that has been tested and works well on mobile devices, you’re at the same level as most companies even if they have a mobile app. Even though mobile users spend 89% of their time in mobile apps, mobile websites are also part of those mobile apps. There is a blur between the mobile web and apps whether mobile users are on Facebook, Twitter, or Google apps. There is no easy way to say that website vs mobile app has an easy answer especially given that they blend together so much. The easiest way to gain access to customers in the mobile ecosystem is a responsive website. Although a responsive website will give you access to the mobile ecosystem, if they aren’t done by a web designer that focuses on the purpose of a website rather just a website, you’re not going to get good results. You want a web designer who designs with purpose to ensure your project is a success. Whether your business has a need for a website or a mobile app, the goal is always to convert visitors into customers.